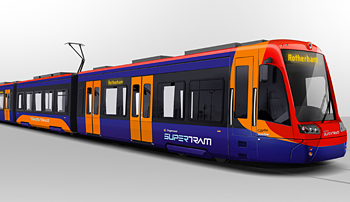 Sheffield is embarking on a national pilot for running light rail trams on traditional heavy rail train track. The transport authority in charge have today confirmed that tram trains will not carry bicycles at any time. By setting the precedent that bicycles will not be carried without even attempting to do so, this trial will condemn future projects around the UK to the same fate. The precedent has been set as part of the national trial, bicycles will not be carried on tram trains. I would be very surprised if tram trains don’t start to displace normal trains on some routes. 2.1 That the ITA supports the recommendation of Option 1 as the design to be taken forward for the manufacture of the Tram/Train vehicle. 2.2 In order to provide the optimal position for the priority seating and due to the limitations of the vehicle structural design and legal obligations Option 1 does not include facilities for the carriage of bicycles (other than folding bike). ITA are therefore also asked to endorse that bicycles shall not be carried on Tram/Train vehicles, unless of the folding type. I’ll try to summarise the reasons this decision has been made, the full document is available from here. These get more and more ridiculous as you go down the list! Allowing bicycles would increase competition for low floor space with wheelchairs, mobility scooters, luggage, prams, and standing people. Bicycles introduce objects that are potentially hazardous to passengers, eg sharp points such as handlebars and pedals. This entry was posted in cycling, tram, tram train on November 1, 2013 by Matt. I think the only one I agree with of those is that racks on the outside aren’t practical – and indeed we’ve never asked for them. Some of their reasons are blatantly incorrect. For instance it is a closed track system, there will be no need for the tram/train to brake suddenly, it’s running on normal rail tracks inaccessible to the public. They’ve misunderstood this part in their report. You would have thought in a trial, you’d try things to see what works & what doesn’t. Perhaps banning bikes at peak times and/or having a hierarchy of user for the low floor space with wheelchairs at the top & bikes just above able bodied people wishing to stand/sit in space at the bottom. still not proper reasons mind, but enough for them to put it in the ‘too hard tray’ and seek other reasons not to carry them. Exactly, we should at least try it out to see if it works or not. A trial is the perfect time to do this. Most of their reasons are bogus, they get more and more ridiculous as you go through the document. It’s as if they’ve sat in a room brainstorming all the reasons they don’t wan’t bicycles on the tram. Utterly ridiculous! This implies cyclists are imbeciles! Offended to say the least! And if dlr can make a success of it, then this is simply a case of bureaucracy because they can!